The disease, which is spread through contaminated water, kills about 100,000 people every year. It is the first time governments, the World Health Organization, aid agencies and donors have made such a pledge. 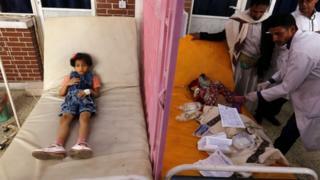 It comes as Yemen continues to fight one of the worst cholera outbreaks on record. Cholera has been spreading in the war-torn country due to deteriorating hygiene and sanitation conditions and disruptions to the water supply. More than 770,000 people have been infected with the disease, which is easily treatable with the right medical equipment, and 2,000 have died. Many of the victims are children. These huge outbreaks tend to grab the headlines, but there are also frequent outbreaks in so-called cholera "hotspots". Cholera is an acute diarrhoeal infection caused by ingestion of food or water contaminated with the bacterium Vibrio cholerae. It can spread quickly and widely in cramped, dirty conditions. The infection is cheap to treat with rehydration salts, and easy to avoid altogether if people have access to clean water and decent toilet facilities. But about two billion people globally lack access to clean water and are potentially at risk of cholera, according to the World Health Organization. The UN health agency says weak health systems, and outbreaks not being detected early enough also contribute to the rapid spread of outbreaks. Dr Dominique Legros, who heads up the WHO's cholera programme, told the BBC: "We can't keep seeing these huge outbreaks every year. "We have the tools at hand to prevent them, so let's use them. "If you provide water and sanitation, it's enough to stop the transmission of cholera. "We've seen that today in countries like Senegal, where we have been able to stop transmission." Cholera is a disease of the poor, and building basic infrastructure for communities costs money. However, there is no expectation of any major pledges of cash at Tuesday's meeting. The charity Wateraid estimates it would cost $40 (£30) per person to provide water, sanitation and hygiene. Its chief executive, Tim Wainwright, says that is "surprisingly affordable". "Looking around the world, the map of cholera outbreaks is essentially the same as a map of poverty and marginalisation. "The fact that this preventable disease still sickens 2.9 million people every year and kills 95,000 people is a global badge of shame." The oral cholera vaccine is another important part of the fight against this enduring disease. It only offers protection for up to 3 years. But in situations where outbreaks are highly likely, it can save thousands of lives. Some 900,000 doses of the vaccine are currently being sent to refugee camps in Bangladesh where almost half a million Rohingya Muslim refugees are gathering in squalid conditions after fleeing violence in neighbouring Myanmar, also known as Burma. "The vaccine alone doesn't solve the problem, the water and sanitation is a more long-term solution," said Dr Seth Berkley, chief executive of the Global Alliance for Vaccines and Immunisations. "In the interim, we need to work to ensure we are doing both." Northern Europe and the US managed to eliminate cholera 150 years ago. Tuesday's pledge aims to, finally, achieve that goal for some of the world's poorest people.